Today is day 24 and my mission is to present you with a mascot for my health issues. Sorry it's not a cute animal or a celebrity, but I choose Dorothea Dix. Unfortunately, as it is past midnight and I have to get up relatively early tomorrow, I will only provide you with the Wikipedia link (click on her picture). 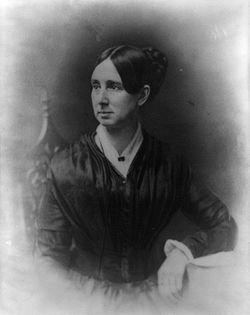 Dorothea Dix was a woman who was one of the first people to advocate for mental health reform. It's sort of ironic that in the mid-1800s, mental health reform meant getting the mentally ill out of their homes and into institutions, because they were being mistreated in their homes. Nowadays, we are trying to get people back into the community and out of the institutions. Mental health reform may have changed a lot since it first started, but still we must pay homage to those that paved the way for positive change in the mental health world. If you like The Sparrow, or Jane Austen, or Umberto Eco, or Wilkie Collins, don’t tell me you don’t like science fiction, or romance, or fantasy, or mystery. Feel free, however, to tell me that you don’t like bad science fiction, or romance, or fantasy, or mystery. Because I don’t like bad books either, and that includes bad literary fiction. I cannot walk away from misogyny for a moment, and so I cannot for a moment walk away from feminism, either. I cannot set it aside any more than I can set aside my womanhood. No—I will not.The choice is mine, and I choose to face the world equipped at all times with the only tool of self-defense I have against inequality. Feminism is my sword and my shield, which I carry because the world is hostile to me, not the other way around.